Thank you to everyone who shared their evening with us last Thursday at Georgia Tech! I think the event came off really well, and we were happy with the content and the speaker presentations. I hope the material was informative and thought provoking – we certainly worked very hard on the event elements and we wanted to provide as accurate a depiction of what we experienced as possible. Special thanks to Molly and Chris from Students Organizing for Sustainability at Georgia Tech for co-hosting the event – you guys are awesome, and your team really helped us out tremendously! Heather from Myriad Fine Art, Jen & Steve, thank you sincerely for the photo exhibit. Thank you to our guest speakers Jeff Duvall, Dr. Marilyn Brown, Lori Bosarge, and Polly Sattler – your testimony really provided helpful and inspiring content. Sarah and Michelle from The Hub – thank you for all the support and encouragement these past 3 months. Thanks to all the individual supporters for the donations that have been provided – we could not have done this without you! And, to all that have shared in our journey thus far, namaste. 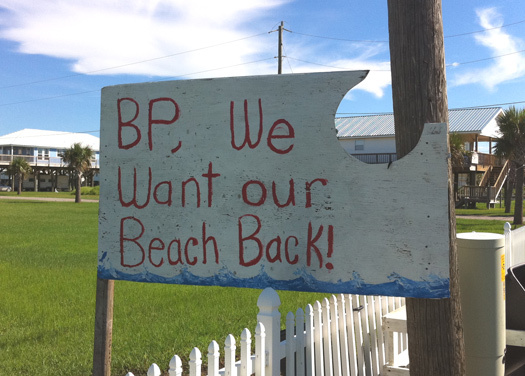 Today marks the 6 month anniversary of the BP well explosion and I thought it would be fitting to take a moment and reflect on all that has happened since then. During our expedition, we witnessed firsthand how local communities along the coast have been seriously impacted by the disaster, and how they continue to reel in its aftermath. Let’s not forget the tragic consequences of the spill, despite the fact that the well has been sealed and there is no longer 24/7 news coverage of the oil erupting into the water. I hope that we will learn from this experience and each take a personal inventory in our own lives so that we can make more informed decisions with energy choices and consumer products in the future. 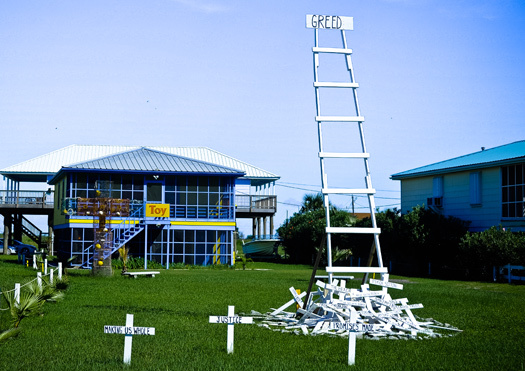 With this project, we wanted to show the human side of the BP disaster, and provide some helpful resources for people to consider as they make choices in their day to day life. Each of us plays a part in the system that keeps oil and other fossil fuels embedded in our culture. There are some tough decisions ahead to be sure. The good news is that we have some incredibly smart people working on energy alternatives that are available now, but we need the public to rally in support of a clean energy future. Do we want to let this disaster fade in the public consciousness or do we want to learn from it and make bold choices for our future? Are we ready to take steps in our own lives to lessen our impact, or are we going to keep doing what we’ve been doing until someone or something forces us to stop or adapt, however painful that might be? These are some questions that I am pondering today. 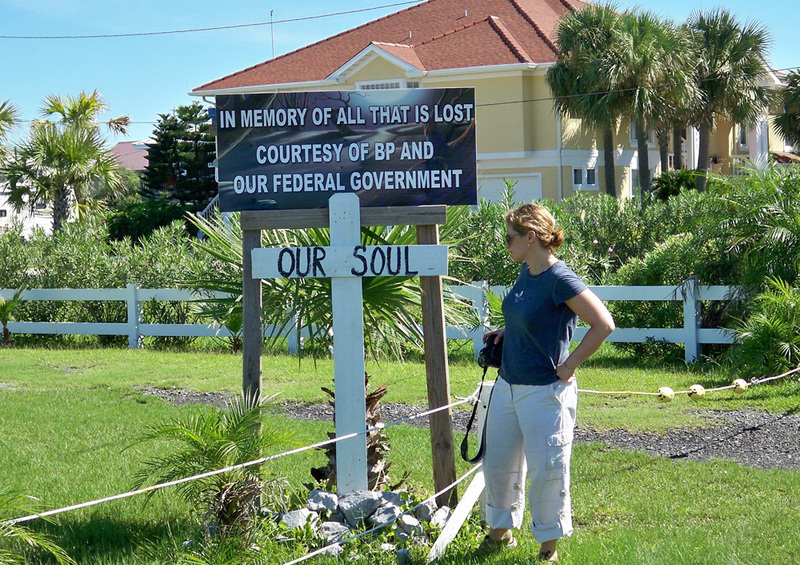 I would like to believe that the 11 people that lost their lives, the countless animals that have been killed, the ecosystem that provides life and sustenance to so may people, and the residents living with the aftermath along the coast have not been forgotten, and we are capable of learning an important lesson and taking a stand for the long term health of the Gulf Coast and its inhabitants. I would like to recommend 2 books that were instrumental to me in getting engaged on the issue of oil dependence – these books provided the foundation for this mission some 2 and a half years ago. They are: The End of Oil by Paul Roberts and Winning The Oil Endgame by the Rocky Mountain Institute. If you even have an inkling of interest in this topic, these are excellent resources to consider. What about you? What is your take on this? Are you taking steps to lessen your consumption of oil and products made from oil? Do you agree that we need to look inward and take some personal responsibility? At the event last Thursday, we had personal pledges on the back of the programs that provided suggested steps that each person consider to reduce their own impact on the system. These are listed in the Actions to Take section on the right column of the website. Have you taken any of these steps? If so, please leave us a comment below. Please do stay in touch with us as we continue to post suggested action items that we can all take in our day to day lives to lessen our reliance on oil. If you are not already subscribed to our blog, there is an email sign up form on the top right so you won’t miss any future posts. Thank you again to everyone who has stepped up to the plate and taken action so far. Each person really can make a difference. Last Tuesday, we had a fun preview reception about our exhibition at the Hub Atlanta and it was a blast! In an intimate gathering of some of Atlanta’s most environmentally conscious leaders, there was a lot of friendly banter between everyone. There was plenty of wine and platters of tasty local food from Radial on Dekalb Ave. After a bit of mingling, everyone settled into their seats and watched a clip about what inspired the trip for all of us on the team. The video served as a great starting point for discussion. Nathan, our videographer, talked about how seeing oil rigs for the first time left a lasting impression on him. Brandon discussed what inspired the trip and how all of us saw things that we didn’t expect. The conversation went from the role of media coverage of the oil spill to parallels in community dependence of oil in coastal communities to a similar dependence on coal in mountain communities. What was most encouraging was when the conversation transitioned into how we would address these topics in the upcoming event in October, there was a lot of interest. People were sincerely engaged by what we wanted to present and even shared some great ideas on how we could make it better. The feedback has personally given us even more momentum for making this event a huge one. Thanks to all who came to the preview reception. You’ve lit a new fire in all of us to do all that we can to make this as eye opening and provocative as possible for all who attend. We can’t wait to see you on October 14th! Saturday evening, we went down to the bridge on Grand Isle to speak with some locals and get their perspectives on the oil spill its affect on the water. It didn’t take long to get them talking; there is a lot of passion and enthusiasm in this community. One of the guys we spoke with told us that despite tar balls washing up on the beach daily, he believes the water is ok now and the shrimp are safe to eat. We heard conflicting stories in our visit, but the over-arching message that emerged was that things are beginning to settle down and return to ‘normal’ for many of the locals. There is a strong need to believe what they are being told by the local officials and government agencies such as NOAA, because the water and fish that live in it are truly their lives. Without fishing, there is no community. Fishing is a way of providing food, income, time for family and friends to spend together, and also a way to simply relax. All of this and more was lost when the water was closed to fishing. 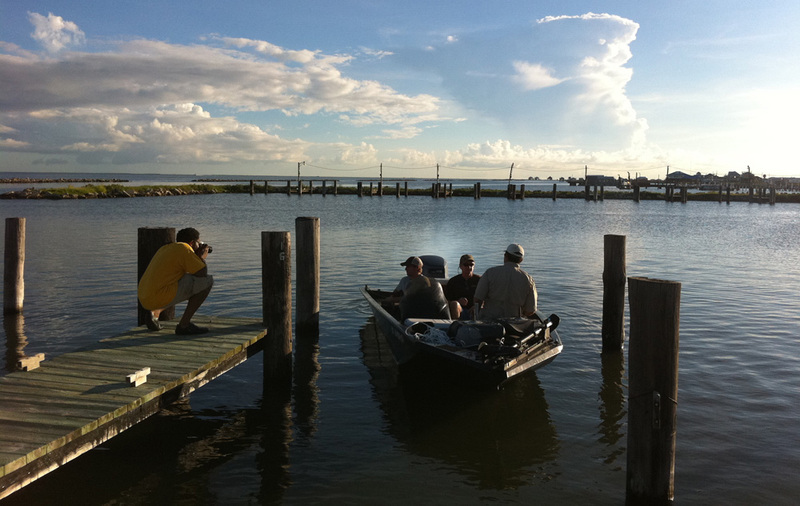 We were on Grand Isle just 2 weeks after some of the waters in the area were opened for fishing again and there was definitely a sense of relief amongst the fishermen that they were able to return to this important ritual that sustains them on so many levels. However, when the conversation veered to the presence of chemical dispersants in the water, the tone changed. In future posts, we will dig deeper into this issue, including in-depth interviews with Lori from Alabama, who told us about the ongoing use of dispersants and their affect on the water and air near her home. We posted a quick entry on her perspective on dispersant use, but will be revisiting this issue in greater detail in the days ahead. Saturday on Grand Isle was definitely different than anything I could have imagined before we embarked on this journey. There is definitely a spirit here – one that defies description. It was this spirit – the spirit of the people in this community and many others like it that drove us to come on this amazing journey. We got up early to catch the sunrise over the beach behind our ‘camp’ – this is how the locals refer to the compounds that are essentially houses on stilts that are full of bedrooms with multiple beds in each bedroom. The camp we are staying in has 6 bedrooms, and more beds than we could even think about using. Josie at the Port Commission found this place for us after all of the cabins and motels we called were totally full (mainly with BP cleanup workers, Coast Guard, etc.). Josie has truly been the most helpful resource we could have asked for here on Grand Isle, and we can’t thank her enough! So, Saturday morning bright and early we walked out onto the beach to get some pictures. 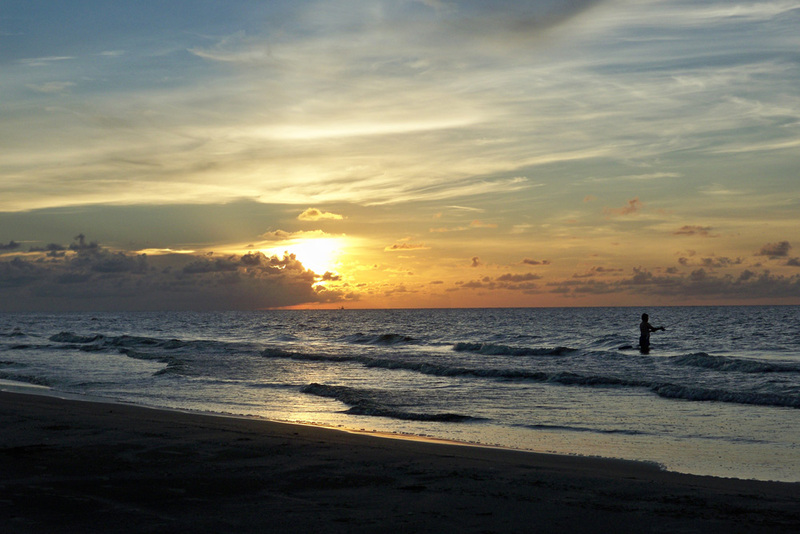 I got what I believe are some very beautiful images of a fisherman wading in the tide at sunrise. We met up with Kim and Terrell who had been hanging with the fishermen on the pier and talked with a group of fishermen that had just arrived and were getting ready to head out on their boat (video to come soon). They didn’t seem bothered by the oil fallout and were happy to be back out fishing. After our quick chat with them, we regrouped back at camp before heading out to the East side of the island where we quickly ran across a very poignant scenes that was a harsh reminder of the magnitude of what happened here in this region and just how much of an impact it has had on the lives of those in these communities. Earlier, I had made some phone calls to arrange a boat to take us out into the Gulf, including one to Captain D, who Josie told us about Friday evening. Before leaving on this trip, we knew we wanted to get out and see the water and shoreline from the perspective of the local fishermen. Their stories have been particularly of interest to me personally after my conversations with a few of the local fishermen in Venice a month ago. Since the oil spill, the fisherman have not been able to so what they love to do most, fish. So basically, you either sign up in the Vessels of Opportunity program (work for BP) and hope to get picked, or you don’t work. Some of the people that did sign up on the VOO program were not picked to be utilized. After a few phone calls, we ran across one of them, Kenny from Bent Rod Offshore Fishing Charter. We made it a point early on in the planning stages of the Sprit of the Gulf Coast expedition that we were going to try to support the local economies as much as possible, and since fishing is such a huge part of the economy, chartering a local boat and having the time to connect with one of the people on the front lines as he gave us a peek into his world was a no brainer. There are limited areas of the Gulf that have been reopened to fishing in the last 2 weeks, so some fishermen are back out on the water. But that doesn’t mean things are back to normal. Kenny would normally have a full calendar of charters this time of year, but today we were able to call him up and get out on the water a couple of hours later. In my next entry, I’ll describe our 3-hour trip out into the Gulf with our incredible tour guide, Kenny, along with video footage of oil sheen just offshore and barely detectable, but nonetheless present crude oil droplets. Stay tuned for more to follow soon. In the meantime, here are a few photos I took on Flickr.